It began during the weekly process of selecting the songs for worship at the church I was serving at. * In seminary at the time, I was a co-worship pastor, choosing the songs half of the month with my colleague choosing the other half. Every week we would send an email to each other and to our senior pastor (who himself was a music leader and gifted musician) and there we would hammer out our song selection for that coming Sunday. To my surprise Jay, our pastor, despite all my protestations and reasonings would not let me (us) do the song in our church. He did not think it was a good idea for our congregation and he had his reasons. Once I moved past my own hurt and frustration and once I realized Jay was not backing down on his decision, I had to find out why he was standing his ground. It was simple: He thought the rhythms of the verses were hard to sing, being too jagged and syncopated. He thought it would be too difficult for everyone to catch on to. He did not want to put a musical stumbling block in the way of God's people. 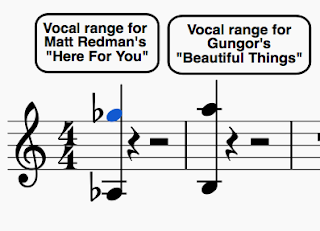 The verse ("Praise you in the morning..") starts on the "An" of the first beat of the measure as an 8th note tied to a 16th note, followed by 3 more 16th notes, two on the same note (a B) and one a minor 3rd down (a G#). Then we get a dotted 8th note followed by a 16th note tied to a quarter note. The verses consist of 2 sets of 3 measures essentially just like the first measure, with the last measure in each set varying with some triplet 8th notes. Looking at the actual notation now makes me turn my head and wonder, "If I was a normal person having just a little knowledge of how to read music, would I even know how to start learning this song?" Personally, I am still fine with the song and I love it. But that day my pastor caused me to think in a way that I have never been able to shake off. From then onwards in thinking about the music I select for church my one and only thought has been "Can people sing this? How well will they be able to learn it? Will this song in actuality make it significantly difficult for the people of God to worship God?" Inevitably, what it did was cause me to start to lose faith in the onslaught of contemporary worship songs coming out over the past two decades. It has caused me to second guess every song I choose, hoping that in doing so I would not be would hindering the Church's worship. I entered into a confusing liminal stage, which I am still in, one where I am contemplating this question: Do I mostly abandon contemporary worship altogether or do I go about the arduous process of carefully selecting contemporary songs and then revising them when necessary? Herein lies the key to the chipping away of my beloved contemporary worship music (I say that with no guile. For better or worse, I consider contemporary worship my Church music heritage, and the songs of the past two decades have built up and undergirded my faith). It would seem, through example after example, that contemporary worship stands to mess with and make difficult the task of the normal church goer. Look at the strange rhythmic patterns they offer us, even varying the second verse with a pickup 16th note ("So take me as You find me" and "I give my life to follow"). All of this might be fine for audible learners who can absorb a melody over time, especially those who purchase or stream worship music on a regular basis. But what about Joe-Six-Pack who wants to find a way to express his worship of God through music but then we, as the song leaders are always setting him some kind of musical trap for him to fall into? Not only is the song audibly difficult to learn, but we also typically do not supply him with a visual aide for learning the melody, only putting up the bare lyrics on our HD projectors, absent of the lined-out melody placed on a musical staff. Both visually and audibly we have made the process a wearisome experience. Whatever the song is, it will be mostly over by the time he has begun catching up to what the music is doing, assuming he has a decent amount of musical skill. A bit of a sidenote is in order: It is not good enough to say "People sing their guts out a rock concerts, they know every word, sing as high as they can, and have no trouble with the syncopation." I am sorry to say this is not an argument at all for syncopated communal singing. The "rock concert" is a rigged system. People go to a rock concert having had hours of musical preparation (listening to the artist's music in their cars, homes, and on their computers and ipods), that is, they know the music and words already and they already love that music. That is why they are at the concert in the first place! They have already shelled out tons of cash and have sectioned off an entire night of their lives to spend time in the presence of an artist they adore and have known for years. Also, chances are they are slightly to more than slightly inebriated (which is a factor in uninhibited singing!). Making church music is a whole other system entirely. In my context hardly anyone listens to CCM radio or worship music. They do not idolize Chris Tomlin or Hillsong and therefore I am typically the first person to introduce a contemporary worship song to them. The situation is often the same for the older hymns I teach them. You might as well say "People should be able to memorize entire long passages of Scripture because they easily memorize ALL KINDS of sports statistics and names without any problem." It is sad to say but there is a tragic assumption in that statement, which is that people care as much about and investing as much time in memorizing Scripture as they do in remembering who won the world series in 1964 or knowing how many home runs Hank Aaron hit in his career. Therefore, what Every song leader needs to take in account is their congregational makeup is going to be unique to their context and they have to be absolutely mindful of that context when selecting songs, making it an attempt to meet their people on some idealized middle ground. This is why church music often does not sound good: the song leader has not taken the time to meet their people in the middle of all of their musical backgrounds and abilities and therefore they have not created their own communal musical expression. In churches where the musical production happens on a larger scale (think large worship bands) the music team just rushes on ahead of the congregation, leaving them in the musical dust, lapping them and looking back resentfully saying "Why aren't you guys singing?!". People in those churches disengage from the music (and from God! ), left just watching the worship rock concert in the dark as light show pulses up on the stage. 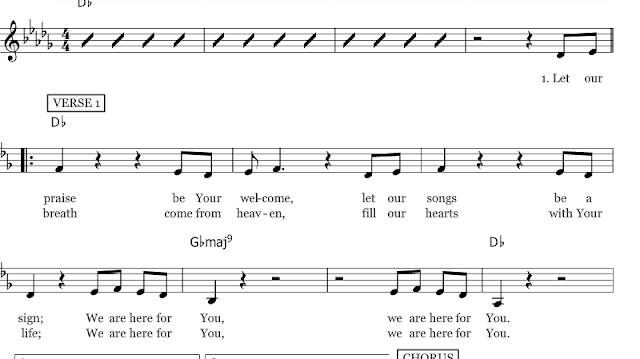 In the churches with a smaller musical production the congregational song just kind of sounds bad, which is mostly fine as long as the song leader is working towards teaching his/her people how to sing. Eventually though, if some intentional times of learning new music and musical technique are not undertaken they too will disengage. This leads to another reason I have lost a good deal of faith in contemporary worship music, another reason I really feel for the common worshipper: excessive vocal range. To start with it is my opinion we should not be putting songs in front of people that do entire octave jumps from verse 1 to verse 2 or from the first chorus to the second chorus, not unless we are very careful about it and we prepare people for it. I know why worship songwriters do it (for dramatic effect) but most of the time this is a cruel musical trick to play, it is rude, and it does not aid people in their worship of God. Added to that, it is not helpful to the men who are not comfortable singing in high ranges (or even able to) and is not helpful to women who are already having trouble harmonizing above the already highly placed tenor voice of the male worship leader. Here are some perpetrators of this seemingly innocent worship crime. Notice the leaps in the verses. The Redman song has people singing a range from an "Ab" below the staff all the way to an "F" at the top of the staff—the bridge even has them up to a "Gb". That is nearly two octaves. That is insane, and again rude. The Gungor song is no better, reaching from a low "B" in the verses all the way to a high "A" above the staff in the raised octave version of the chorus. What is going on here? It has been pointed out many times before in other publications, but what is going on is the expressions of solo vocal pop music is being applied to contemporary worship music, despite the fact the latter is by definition corporate congregational singing, meant for small to large groups of people with varying degrees of singing ability and not professional virtuosos. There is one alteration I have been able to do, which might be a start to restoring my faith in contemporary worship music, and I do it whenever possible and when the change does not significantly alter the song: I simplify the rhythms. While not managing to fully even out the line, what I have tended to do with this song is sing the first two notes as equal 8th notes ("There is") and I hold out the first syllable of "Sorrow", not saying "row" until the second beat of the next measure. I make similar simplifications throughout the song, hoping it feels more "evened out". Techniques such as this is how I am working my way back to loving and using contemporary song in my congregation, though some of the compositions, as I pointed out above, have made themselves inaccessible to a great portion of the singers in our churches. To sum it up: worship leaders do not just assume people are going to learn a song because they are used to a certain kind of music. Take time to consider exactly what the music in a certain song is doing. If you feel the music is hindering God's people from worshipping, adapt the song as necessary, take the time to properly teach it to them, or do not do the song. And to think all this started with a somewhat heated (at least on my end) email conversation 5+ years ago where my pastor opened my eyes to something I had never seen before: that not all new music is good music and that the music we select for God's people to sing can actually be a detriment. I am incredibly grateful to him, even though it has haunted me ever since. I am OK with being haunted though. What matters is whether the people who go to my church can actually sing the songs I put in front of them, and so singing, their hearts, minds, and bodies are then able to commune with almighty God in worship. With that task in front of me, I think I'll continue to struggle for quite some time. With more thoughts on some of the dilemmas of the modern worship movement, you can read my review on Matt Redman's latest album Unbroken Praise. Music Matters: Two Versions of Aaron Keys "Sovereign Over Us"
They could always, ya know, write better music that's more suited for congregational singing. There's a reason hymns were used for so long and still are today: they're easy to learn, they (usually) have a steady rhythm and limited range, and they can be played almost effortlessly by organ or piano, or even a praise band if you desire. The biggest plus is they usually are theologically rich with evocative words. Very few of the CCM tunes of the last quarter century have this. Tokkemon, I agree almost completely. Yeah, they need to be mindful and intentional in the music they're writing. In my church we draw from a lot of musical sources and sing hymns along with contemporary. I don't necessarily agree with the depth of the theological lyrics. It is a problem but it has ALWAYS been a problem. There's a lot of great stuff being written nowadays, it's just up to church musicians to find it. Go to any type of concert, and the people are singing along, regardless of so-called complexities (and to be honest, few worship songs approach anything resembling complexity, including those mentioned here). If your congregation is disengaged, maybe it's because they are bored, not because they can't sing the songs. It is the job of a worship leader to help engage their hearts, not just their mouths. More importantly, it's the job of a worship leader to demonstrate worship, in this case through music - giving that part of himself to God in Spirit and in truth. If he alters his worship through music to appease others, what part of himself is he giving truthfully to God? How then can he expect to effectively lead others in giving genuinely to God when he has demonstrated such appeasement? Shall we worship God according to the desires of others instead of honestly from our hearts? These are not good lessons to demonstrate. The music doesn't matter: How are you demonstrating how to worship God from your heart? Anonymous, you are unnecessarily bifurcating the human experience. This is a both/and situation. We shouldn't blame someone for not getting enough nutrition if the only food they ever knew tasted utterly awful. In the same way the music we sing in our churches matters. It is a practical matter that song leaders must consider because everyone has limitations. Yes, to all your points about people's hearts and about seeking God passionately and sincerely. I love that and agree with you fully. However, that is not what this article is about. It is about the practicalities of music. The subject you spoke on if for another article. I couldn't agree more... I took 8 years of piano lessons and played in a band throughout Jr. High & High School. I still can't read half this stuff. Unless I already know the song, it's very hard for me to keep up. The unfortunate result for those not musically inclined is that they choose to enjoy the music but not participate. Then, you're reducing worship to attending a concert instead of worshiping God. Anonymous #3, what a fascinating response. I've never been talked to like that on my blog. Are you a follower of Christ? What a strange way to respond on an article about worshipping God and worship music. Do you have a musical background? And do you lead music in a church anywhere? I think I'd like to speak to your supervisor. Churches are as unique as the individuals inside them. If you think some of these songs are turning off your congregation, maybe that's so. In my experience, however, it's not been syncopation, range, or even the dreaded octave jump that turns people off in worship. Gospel music has been breaking these rules for far longer than worship has been called "contemporary." Instead, it's the fact that they just don't know the song. The classic hymnody had advantages of both time and permanence. If you've got 578 hymns in the book, given 5-6 hymns a week, you wouldn't be able to go 2 full years without repeating. Of course, there were many that were repeated far more often, and thus learned. Further, if one could follow music, one could at least do a passable job with most hymns because the printed music was right in front of them. More on that at the bottom. By contrast, too often we as worship leaders expect our congregations to magically "get it" when we introduce a new song. How do we introduce this new song? By playing it exactly the same way that we will play it the next few times that we do it in service. There is no guarantee that the song will ever be played in the future (permanence), no musical guidance to help congregants participate, and let's be honest, a lot of songs fall off the rotation before time can hammer them home. Absolutely a problem. The solution? Worship leaders need to intentionally teach and coach their congregation on how to participate in this (relatively) new way of corporate singing. The vast majority of the folks in the seats grew up either with hymns or attending concerts where they served as consumers of music rather than participants. We need to coach them in how to participate (give permission, model, practice) and we need to teach the songs. Get up there with just the acoustic guitar, put the whole band on mic, and go through the chorus phrase by phrase. We see this in concerts all the time, and the crowd gets incredibly excited to sing "na na" and "oo oo" lines. We actually have something of substance to participate in, but we have to open that door. And then we have to leave that door open. Let your alto or tenor backup singer cover your octave jump in "Beautiful Things" while you stay in the lower octave, achieving a similar musical effect but keeping your congregation comfortable. Be incredibly intentional with rounds or call and response or parallel singing (leader needs to stick with whatever you want the congregation to sing, no matter how cool it sounds for him to sing the bridge against the chorus). Try intentionally directing the congregation to reflect on God or praise Him during the instrumental break. Maybe have your "off week" band members model the participation you want the entire congregation to demonstrate. In fact, you might cut back to one or two people on the platform for a few weeks and instruct the rest of the band to model in the congregation. In the end, it's easy to blame the material, but when we can see it working in so many churches, it seems that the material isn't necessarily the issue. Regarding the hymns, they're not always so innocent, either. My very first church job, our pastor loved to pick hymns that directly related to the sermon or the passages he was referencing that week. This meant that we got to sing a lot of those hymns that hang out in the cobweb-filled corners of the hymnal; those pages that never saw the light of day unless someone was flipping through to "Wonderful Grace of Jesus." I can tell you from absolute experience that my choir (mostly grey-haired saints who have been expertly singing hymns all their lives) struggled mightily with the melody, text, and rhythm of those hymns. On the other hand, "Let Everything That Has Breath" became a staple at my next church, with the congregation singing freely and easily. Hmmm... a very interesting article. I admit, I've never really considered how the rhythmic pattern of a song might make it difficult for a congregation to follow. Likewise, when a song is in a difficult range, I automatically (almost unthinkingly) fall into a harmony that fits my range. I know that not everyone can do the later... for me it comes naturally. But the point you made about the rhythms of contemporary worship songs is really something to think about. Yet while I see your point, its also something not to "overthink" in my opinion. Simplifying the rhythm is a good idea, especially if you are just introducing the song... however I also think that music in general is a natural part of the human experience. Every day, everywhere, everyone is listening to some type of music. Whether they realize it or not, they do pick up on the small details... granted, repetition might have something to do with ingraining those small details in memory, but the details are part of the experience. On that note, everyone is, to some degree, and auditory learner (unless they are deaf or hard at hearing, which of course provides and obstacle in that area of learning). I guess I should say, everyone who can "hear" is, to some degree, small or large, an auditory learner. We don't even realize it. We pick on gossip, follow spoken direction and orders, listen to music... This, all through our ears. Some of us are better trained or talented enough to notice the distinction in small rhythmic and tonal differences in music right away, but that doesn't mean that others can't pick it up. One thing I noted from a team I was on a few years ago... When the worship leader introduced a new song, much of the congregation didn't join in right away. The lead would sing at least the first verse through once, introducing the song to the people, then the rest of the team would join in... usually by the time the song was repeated, the congregation had joined in to some degree. The first day the song was introduced was always the most difficult it seemed for the congregation, but that was to be expected. They listened to the song once to hear the lyrics and learn the melody and reflect on how it pertained to their worship... they tried to join in the second time without really knowing the song, and usually it was a mess... but no more than expected... and even then, they sang from their hearts, trying to make it mean something to their own type of worship. A lot of the time the worship leader would then try to include the song the next week, or maybe skip a week and include it a few weeks later... By then, even though the congregation didn't know the song well, they'd heard it at least once and had tried to sing along, so it was easier to follow and less awkward the second time the song was included. Of course the song was repeated over a course of time until the congregation knew it by heart. *shrugs* I know you know all this, so perhaps I'm just beating around the bush now. I think my point is that, while its definitely good to keep those things in mind (the awkward syncopation and rhythm issues and the range problems), we shouldn't be focusing on those things when praying over and trying to choose the right song for Sunday morning. WE may understand these musical terms and how they create problems, but those without a basic knowledge in music theory probably won't notice the difference. And you have to admit, Matt Redman's "Let Everything that has breath" is perhaps a much simpler song than, say Lorde's "Royals", Taylor Swift's new hit "Shake it Off", or even "All about that Bass". Or how about any of the Ed Sheeran songs, or the songs from recent movies like "Misty Mountains" from the Hobbit, or "The Hanging Tree" from the Hunger Games... or... Yes, "Let it Go" from Frozen. Most of these songs are well known and well loved by all sorts of audiences who have no musical background and may not know anything else other than the fact that they like the song. In comparison "Let everything that has breath" may have some slightly strange rhythmic patterns, but is by far a much simpler musical choice. MusicManD and StarDreamer, thanks for taking the time to read the article and thanks for writing. I appreciate your words. I definitely hear what you're saying, especially in that we need to be better at teacher our people how to sing the songs and also that people can do more than we give them credit for and can learn the songs easier than we think. On the other hand, my hopes were that the article would shake song leaders up a bit, causing them to be more discerning in selecting songs and more innovative when it came to how they sang/lead their songs for their churches. My pastor really messed me up when he didn't let us sing that song. It was a good mess up, causing me to think about selecting not just the songs I like but the songs that are best for God's people in this time and place. There is certainly a lot of freedom when it comes to our music, but equally so there should be a lot of discernment. Great piece - I can't sing well, even after a lifetime in churches and even in choirs! And I feel excluded from worship when I can't follow the rhythm or hit the high notes, and it's not for lack of trying. I had this very conversation with a friend (a professional singer) only a couple weeks ago - she visited her sister's church and couldn't sing along, and ended up feeling totally excluded. She won't go back. Difficult songs are not very welcoming to many visitors, newcomers or guests. Unless they just learn that worship is about entertainment? And perhaps this misunderstanding (that worship is about entertainment rather than participation) is at the heart of the issue, if even the composers are making that mistake. As well as choosing simpler music (or simplifying the music you choose), you could also do what we do at our church: display the melody line directly under the lines of text on the screen. You touched on this in the article - I'm just saying it's do-able! Hi, I am a worship leader in a small church which do not have "seasoned musicians" or people that can read music. I sometimes make the songs easier to sing by leaving out all the chord progressions and chord changes. I also would on occasion change the melody to make it easier to sing. I know we would like to do things as perfectly as possible but I have come to learn two things. (not by myself but by fellow christians) 1. Make a joyful NOISE unto the Lord. 2. God does not want your ability He wants your availability. Your task is not to play the song perfectly but to bring HIS congregation into HIS Presence. To many times we want to do GOD's work for HIM by doing things He never asked us to do. I pray the prayer of Paul in ef. 1:17 a lot. God give my your Spirit of wisdom and revelation to lead YOUR people. I agree with the main thrust of this article but believe Chris advocates taking it too far. That verse of "Every Breath" is too difficult for your average congregation. But "Mighty To Save" is widely sung by congregations all over the globe. I think the concerns here are valid but while we should be sensitive to them, we also risk underestimating our congregations. For instance, attempting to straighten out more moderate syncopations in my view is both unnecessary and just stiffens the songs. 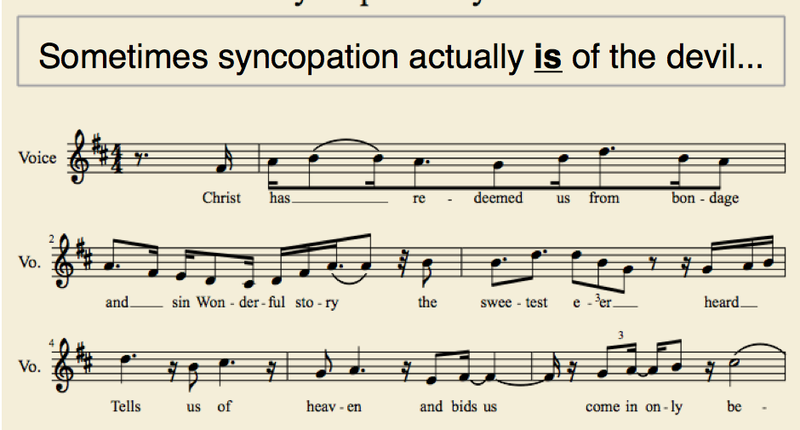 I have heard congregations sing these syncopations in two ways simultaneously... I've heard some people singing them correctly & others being off rhythmically. You would think that the two could not coexist in the same congregation but not only do they coexist, such a difference does NOT cause the congregation to cease from singing. As for octave jumps, I have found that those in our congregations who can't sing them will sing in the octave that is in their vocal range. Furthermore, I have found they even do this with songs that are NOT written octave jumps. We thank you for the article. It is well written and has some valid points. However, as said previously, churches are very different, and congregational 'ability" varies. One of the best ways to help the congregation is to teach the parts and simplify at first, and then bring in more of the syncopation later. But, the major idea of to considering the congregation when choosing songs is a very good one. After 16 years of worship leading, we have discovered 1) lifting up God, 2) enhancing the message, 3) considering the congregation, 4) taking into account which band members/singers are available, and lastly 5) what songs we might like to do is a healthy way to run a contemporary service. We wish you the best. God Blessings and success for your worship service. As a participant in both Congregation singing, and being on the worship team, I agree with a lot of this article. Keep the songs easy to sing, for everyone. I will admit, I have lip synched while singing on the worship team because the song was so difficult to sing and I had hours of practice with the worship team. The congregation just stopped singing. Sing the songs people know and love. Introduce new songs, but if the first time you sing it most of the congregation isn't singing by the last chorus, skip it in the future. and please, leaders, please limit your guitar solos and music interludes to one or two per Sunday morning. I know your guitarist is really good and can play really well, but it's not a concert. Jam on Saturdays with your buddies, not on Sunday mornings. Those singing on the worship team don't even know what to do during those times so why do you think the congregation will 'reflect' during this time? BTW, I'm not old.. but I'm not young either. I'm in the middle. I love to sing songs that have words that line up with scripture, songs you can easily harmonize to, and songs that lead me to truly Worship God with abandon. Keep it simple, keep it in line with scripture and remember you are leading the congregation so they will fully engage in worship thru music and singing. just my 2 cents on the subject. Excellent article and valid concerns. I have been a music leader in churches for over 30 years. I have four music degrees, including a Masters in Church Music. In addition, I was a teenager/young adult during the rise of Christian contemporary music in the late 1960's and during the 70's. I put this info out there because I wanted to confirm to you every issue you brought up as to selecting music that is appropriate for congregational singing. And that's the point - music for corporate singing, by everyone in the congregation. It is a common problem in every church that there are people who do not vocally participate in the singing. And, the truth is, there are some people, that no matter how careful you are with song selection, who just will not sing, for whatever reason. However, your point is that we as worship leaders, do not want to put up unnecessary barriers that might discourage participation. The worst thing is for people just stop participating and just sit back and "watch", becoming a spectator rather than a participant. Most contemporary Christian music is soloistic, that is, it was created and recorded by a specific vocalist or vocalists. Therefore, the rhythm is usually more difficult to sing. It's part of what creates the interest in the song. And, this is also true do Chrisitan music in almost any style, whether contemporary or even classical. We don't take arias from Handel's "Messiah" and sing them with the congregation. This problem has occurred before in church music history. Back in the Middle Ages, just prior to the Reformation, the state of church music in the Catholic Church had become so complicated that only trained musicians could sing it. As a result, for literally hundreds of years the average church goer stopped singing and just listened. When the Reformation occurred, Martin Luther, who loved church music, wanted to reinstall corporate hymn-singing back into the worship services. The problem was that there was no heritage of contemporary hymns that was known by the common person - it had been a lost art. Therefore many of the early Reformation hymn writers used secular tunes that were well known to everyone and set Christian words to the tunes. After a while they began composing their own and all this led to an explosion of Church music for use by the congregation - in fact, the organ became THE instrument of choice in churches because its primary purpose was to help support the hymn singing of the congregation. Anyway, I've gone on too long. I just wanted to affirm your concerns and applaud your efforts to make congregational singing more assessable to everyone, no matter what the style of music ones church is used to singing. God bless you and may your ministry bring even greater praise to our Lord Jesus Christ. Thank you, Chris, for an excellent and well though out article. Over the past few years I have thought over these same concerns and come to similar conclusions. Of course, the congregation is always kept in mind when a new song is being considered. And every congregation is different. I recently removed "Let Everything That Has Breath" from our church's repertoire because everyone sang a different rhythm on the verses. Therefore we started using soloists for them. But we also wanted to keep solos to special music to encourage the congregation to sing out more often. Some songs that jump an octave, such as "Lord I Need You", are easy to put in the same octave so that all the notes fall into a 6th instead of an octave and a 6th. There are many other songs such as "Oceans" that we keep for special music. They're beautiful but difficult to sing. I normally try to keep the vocal range of our repertoire from low A to high D - otherwise our congregation doesn't sing along very well. I don't usually like the idea of straightening out rhythms since it tends to make songs sound slower and more stringent. And then the congregation tends to want to sing them very fast so that they have some kind of life. However, there are songs where I change the rhythm so that it's consistent from phrase to phrase or verse to verse. 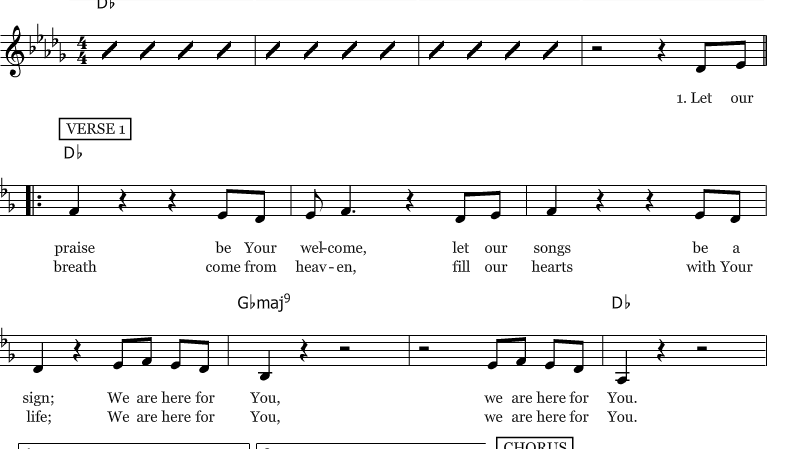 For example, the same rhythm can be used (for the most part) for both verses of "All the People Said Amen". I've noticed that the congregation responds differently to different new songs. When I tried introducing "Happy Day" by Tim Hughes several years ago, the congregation didn't sing along with it. So after the 4th time in 6 weeks we dropped the song. On the other hand, the congregation started singing enthusiastically with "Build Your Kingdom Here" by Rend Collective the 2nd time we sang it, and they continue to sing it enthusiastically. So much depends on what your congregation likes and if they're able to learn the song easily. Let's be honest: The picture accompanying the article's title is an atrocious representation of music notation. Anyone would have a difficult time reading syncopation when written in this manner. As a music leader for the Contemporary service at my church, I just want to add one side note....Something that is very different in this day and age is that people can actually turn on the radio and hear the very same songs they're singing in church. This was not the case with many of the hymns of old, so of course they had to be simpler. What a blessing it is to have our worship songs available any time of night or day with just a switch of the dial. My car radio is always set on the Christian music channels and I know many of my church members also frequent these stations. Even though some of the songs are syncopated and a bit out of my vocal range, I just drop down to where I can sing them. They're catchy and the repetition of words makes most of them really easy to learn with words that stay with me all day long. When we're learning a new song in worship, I often post it on my church's Facebook page several weeks prior so people can get a jump start on the new song. I follow the practice pretty consistently of introducing one new song per month. I believe people appreciate the freshness of learning new songs and the fact that they can hear them on the radio. I think this makes worship relevant to their every day lives...not just one day of the week. I love both classic hymns and well done contemporary worship songs. Many of the accusations toward CCM that the author makes can just as easily be applied to old hymns. Old hymns are often more difficult to sing and have more complicated rhythms and timing than do CCM songs. It really comes down to cultural familiarity. Some people are more familiar with hymn style music. Others not so much. Please don't make the mistake of making this an ethical issue when it's really a cultural one. The only ethical issue here is when we insist that our cultural preferences are right and others are wrong. Re: "Please don't make the mistake of making this an ethical issue when it's really a cultural one. The only ethical issue here is when we insist that our cultural preferences are right and others are wrong." I don't think Chris's article is necessarily attempting to make this an ethical issue, but a musical reality that we, as worship leaders, need to take into consideration that some kinds of music do not lend themselves to congregational singing. Now, if one chooses to ignore the issue because of our personal musical preferences over the needs of the congregation, then at that point it can become an issue of Christian ethics. This is not about culture. It is about musical characteristics of music. The truth is that some songs were written for the purpose of being sung by a group of people, while othe kinds of songs are composed to be performed by a solo vocalist/vocal praise band. Most classic hymns and Gospel songs were written the the express purpose of being sung by a large group of people. That influenced the melody, rhythm, key selection, and vocabulary. Now, it's true that some classic hymns or Gospel songs may have a cultural barrier to people today when it comes to vocabulary. We don't speak the same way people did in the 18th and 19th centuries, so vocabulary can obviously be a problem for modern Christians to sing and understand. But, the qualities of good writing for congregational use still apply no matter what style the music is. There are contemporary praise songs that do utilize good composition for congregational use - such as "Lord, I Lift Your Name on High." Though it definitely has syncopation, the melody is very easy to catch on to and the text is easy to sing, combined with a solid 4/4 beat. That is why this song is so popular with so many churches - good text, nice singable melody, etc. Again, this doesn't mean that contemporary Christian music is "bad" - just that some does not lend itself to being sung easily by a large group of people with varied levels of musical ability. All Chris is saying is that we. Need to be aware of this issue when selecting songs for the whole church to sing. Congregational songs AND vocal soloistic songs can both help the church to praise and worship Christ. There is a place for both types in worship. Re: "This is not about culture. It is about musical characteristics of music." ^ What's difficult to sing for one culture is easy to sing for another. It's about musical characteristics of culture. There is no normative way to do music. Re: "What's difficult to sing for one culture is easy to sing for another. It's about musical characteristics of culture. There is no normative way to do music." So, Mozart and Bach are difficult to sing not because it is musically demanding, but solely because of culture? When I was younger, I had a higher vocal range and was able to sing all my favorite tunes without difficulty, but as I got (ahem) older my range dropped significantly and am no longer able to sing them without lowering the key - is that because of cultural influence or just physical and musical realities that I have to deal with? Look, I am not saying that "culture" has NO influence on musical style and preferences - of course it does. But people having difficulty in singing a song in a worship service may be having difficulty because of pitch, range, tempo, rhythm, etc. That is not culture, that is just plain old musical limitations and reality. I like many styles of music - from rock to rhythm n blues to jazz to classical to bluegrass - does that I mean I am poly-cultural? No. It just means I enjoy those styles of music. I agree there is no one "right" way to do music, and the average guy from A rural country setting might relate more to Hank Willams than to Mozart. But, that doesn't mean that composing a song that is easier to sing melodically, textually, and rhythmically wouldn't also be easier to sing for Hank Williams, or Mozart, a New Yorker, a head-banger, or a guy from my own church. I've always, well almost always, been mindful of range and considered ease of learning a song in introducing something new. At times I will teach only a chorus and encourage the congregation to listen to the verses if it's challenging to sing and still "worthy of worship." A few years back we began listing the album, album art and artist in the worship order to encourage our congregation to listen, learn and worship with during the week. It has helped! Last thought - every church and congregation is different. Some may be able to learn syncopation and some not. Finding your church's "groove" and leading them to worship is our goal! Having had a similar conversation with my own priest at my Anglican parish, and being something of a worship songwriter myself, I both recognize the tendency for the art to grow isolated enough to enjoy personal vocal complexity and range luxuries and overdo them, as well as the sheer appreciation people have for simplicity done well. To me, a song that does well is one that not only has a narrow vocal range and a simple melody though. Both of those things are tools, and ones with a high degree of monotony if you're not careful. But here's the trick. The simpler the melody, the easier it is to make the structure underneath, chordal and rhythmic, more interesting and complicated underneath the strong simple easy-to-grasp melody line. That becomes the art form, to surround a simple melody with something different, without drawing attention away from the main point of the song (the words and melody). Achieve that, and you achieve something great. To those people wondering or confusing what kind of article this is. It is about the bloody practicality of being a bloody musician in charge of non musicians. You make things easier for them when they take part. If they can't do it and you can, wait for a solo performance. If they have to take part, make sure you aren't dumping them in the deep end. This is basic leading, and the fact that it's in the church doesn't take away from the sheer nature of practical leadership. Give people to do what they are capable of doing, and they will enjoy doing it. Teach them something in their capacity to learn, and they will enjoy learning it. Dump something ridiculously difficult for the amateur on a crowd of likely amateurs (who else other than you actually has the experience and training to do this, I mean really... there's bound to be a handful of tone deaf people, if nothing else), and you will end up with people stumbling over words, stumbling over rhythms, losing focus, losing their place, and losing interest in taking part. That's not worship leading, that's misplaced performing. Anyone taking spiritual offense to this article, and I hope to high God that there aren't any even though i realize the world is full of people who can't interpret things well, go learn first, and then contribute to the conversation when you know the parameters of the conversation. Until then, you not only can be safely ignored with impunity, but we all hate you for speaking your misguided mind. Please go away. The author honestly articulates problems that many of us have chosen to ignore. I'm afraid I am guilty (along with the rest of my team) of being "contemporary snobs." When the congregation doesn't "get it" on a song that we have been rehearsing for weeks, we roll our eyes and joke about the glassy stares and closed mouths in the pews. I have had to come to a very depressing conclusion, that contemporary worship will take another entire generation before it suits everybody, no matter how you package it. At my church we abruptly ended all elements of previous church music 12 years ago in order to jump whole-heartedly into praise mode without looking back. I keep thinking, "Don't they see that this is where music has been headed for a century?" Yet probably two-thirds of them would only sing if we cranked up the organ again and sang "Holy, Holy, Holy" every service with the pipes roaring like race day at the drag strip. It's frustrating. Fixing the range and rhythm of songs is a good step, but it won't solve everything. Anonymous, have you thought about re-incorporating hymns but with the worship band? People don't necessarily need the organ if they've got the melody down deep inside them. Or you could even make a hymn more synth-heavy. I'm being a little cheeky when I say this, but being 100% contemporary in your song selection is pretty behind the times. That's so 2005.... :) All I mean to say is, it's pretty common to draw from both the best of what's being written today and from the hymns of the past but done in a contemporary style. And, Chris, even incorporate the organ into the mix for a brief moment. Most good organists can pick up the rhythm and texture of the band, smooth it out over a measure or two of improvisation and segue into a modulation or interlude. Meanwhile increasing the drama of the organ sound to lead a verse of a major hymn, and then rapidly pull back on the stops while the kbd or piano picks up the lead and reestablishes the rhythm. The band joins and the pulse takes hold again and you move on. Your pew people will be thinking, Wow, What Just Happened Here?! Make it the midpoint of a set. If you save that for a once-a-month experience, it will be the high point of some people's worship. You're not giving up anything, you're not making any concessions, you're just adding a totally unexpected texture for a moment. Most recent "Anonymous", I curious what your church music context is. Not everyone has an actual organ in their worship space, though a lot of churches have decent synths, which might be able to replicate something like an actual organ sound. I would love to use the organ in the way you describe, BTW. Okay, I am a 40-something United Methodist pastor with a music background. I believe I straddle the divide between worship styles. Grew up on hymns at church and pop in everyday life. Was drummer in a Baptist praise and worship band when drums were not welcome in Methodist churches. My mother taught voice and piano. My current charge has a large electronic organ augmented with real pipes. The organ was dedicated "To the Glory of God" and I feel that it should occasionally be heard. The title of your post (The moment I began to lose faith...) captured my attention during a Google search and drew me into this conversation. I could never adequately explain to our worship leader why I struggled with singing Newsboy's "He Reigns" as a worship team. ("Too wordy for congregational worship" was the best I could do). I think you finally nailed it for me. Thanks!